One of the best things about having kids is knowing that one day they will cook you dinner… well tonight it kinda felt like that happened. The J-boy just got stuck in and took me by surprise. I’m pretty sure this boy is going to be a great cook. So if you need some encouragement to get your littlies in the kitchen helping you cook, here it is. He has been helping me cook since he was able to stand from his cooking “tower” and he seems to have picked up some tips along the way! My children have all loved helping me cook, at times I’ve certainly wished they didn’t want to help me – it can take twice as long, be noisy and messy, but it teaches them a great life skill and a love of good food. I’ve also found it a good way to get them trying foods too. 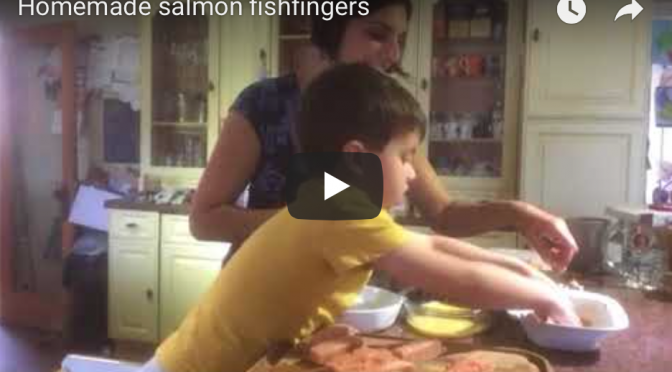 Fish fingers are one of the ways my family do not just eat, but really enjoy oily fish. I like to get a portion a week into our meals. Oily fish are good sources of the omega 3 fatty acids (EPA and DHA) as well as providing vitamin A, Vitamin D, iodine, selenium, protein and calcium. If you don’t like salmon other oily fish includes: mackerel, pilchards, fresh or frozen tuna, trout, crab, whitebait, herring, sardines. Reduction in the risk of heart disease. May protect the heart and blood vessels from disease. Supports healthy development of baby during pregnancy and breastfeeding. Brain function – may help maintain good memory and also for the prevention and treatment of depression. Recently I was very pleased to be passed on some kale. A fair amount of kale that needed using quick, so we’ve been going a bit kaletastic. Salmon and kale = one of those winning combo’s in my mind. It turns out the small people agreed with me and hoovered up their dinner. One happy mummy as they got a whole heap of goodness from this meal. This was also our first meal eating al-fresco this year. Love love love. It always surprises me that the J-boy who is not always the keenest vegetable eater will happily eat his greens when mixed into meals. If you have a child who isn’t keen on veggies then try this out on them. Sometimes having your veggies on the side makes them harder to eat, so I tend to incorporate them into as many main meals as I can and then add some on the side too. Kale: Packed with vitamins C and A (1 cup provides over 200% of the RDA for vitamin A and over 100% of vitamin C), also providing calcium, vitamin B6 and some iron. Kale contains the powerful antioxidants beta-carotene, quercetin and kaempferol. These have numerous health benefits including fighting cancer, oxidative damage to the body, anti-inflammatory and anti-ageing. Salmon: Omega 3’s, one of the unsung heroes of our diets. These can help protect against heart disease, play a role in helping treat depression and are important for the development of a baby. You want to be including these in your meal plan 1-2 times a week if possible, once only if you are pregnant. 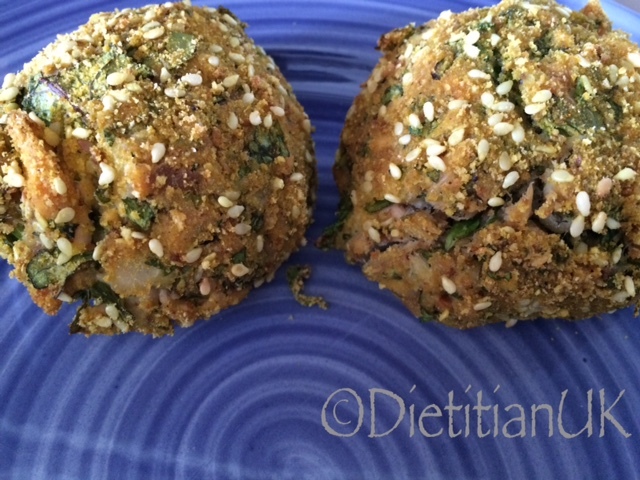 Oily fish are the best known source but linseeds, walnuts and tofu are some alternatives. Sesame seeds: High in calcium and iron content, magnesium and B6. I included these for the texture and the calcium and iron content as I am in the late stages of pregnancy so always thinking about keeping my iron and calcium stores up. Call me paranoid…. Place the salmon in a pan with the milk, allow it to poach for 10 minutes. Then strain the milk into a jug, get as much liquid as you can out of the fish. You can keep this to use in another recipe such as a cheese sauce. Meanwhile chop up the kale and chives. Now break up the fish into small flakes, mix with the kale, chives, pepper and egg. The mixture should be wet but not sloppy as you want to be able to shape it into balls. Place the breadcrumbs in a shallow dish, mix in the sesame seeds. 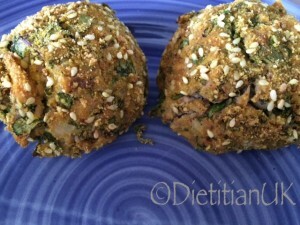 Roll spoonfuls in you hands into balls, then drop into the breadcrumb mix and roll the fish ball in it. Place onto a lined baking tray and pop into the fridge for an hour to firm up. (Make ahead up to this point). Bake at Gas Mark 5 for 20 minutes.